'Aapka Khoon Khoon Aur Hamara Khoon Paani!' - This is an old Hindi proverb and it literally translates to 'your blood is blood and our blood is water'. In many ways, this aptly describes the likely thoughts of the survivors and sufferers of the Bhopal Gas Tragedy. 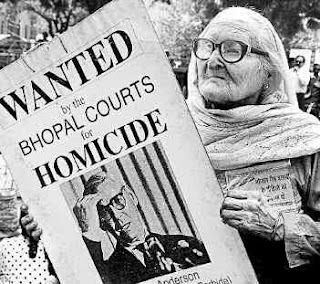 25 years ago noxious methyl isocyante fumes from the Union Carbide pesticide plant in Bhopal escaped the plant in the dead of the night, exposing over half a million people who were asleep unaware of the disaster. According to the MP government, a total of 3,787 people lost their lives. This was just the instantaneous death toll. Lingering effects of the poison in peoples' systems went on to kill many many more with some estimates even running close to 20-25 thousand fatalities. Innocent human lives - women and children notwithstanding, were lost. And 25 years since then, it seems like nobody cares. Well, this one disaster was by and far the single largest chemical disaster India has faced. And this one disaster actually contains instances and examples of almost everything that can be wrong with the system, with everything wrong stemming from greed and a gross lack of respect for human lives. A complete, credible investigation never really happened, and even now theories and conspiracy theories abound on why the MIC escaped the plant. But some fundamentally wrong aspects do snap out at you. Like why use MIC, a known hazardous chemical in the first place? When almost all over the world, technology had improved incorporating the use of more inoccuous chemicals. I am sure the hazmat controls in OECD countries would surely not have allowed such potentially hazardous plants to set up shop on their soil. Secondly, the chase of the bottomline made the plant managers not pay attention towards the upkeep of the safety system. Yet again, I wonder whether Indian human life is indeed so inexpensive. Whether cost benefit analysis valued Indian human life at close to 0? I am tempted to wonder why human life is not uniformly valuable across countries? 25 years on, the survivors still grapple with acute health disorders. There are also some reports of abandoned chemicals seeping into ground water reserves - I don't know how credible these reports are, but if they are, then the nightmares for the afflicted seem to never end. More than the physical damage, the psychological damage is heavier. Having a city mercilessly wiped out by perpetrators of a crime is painful. Knowing the motives behind the crime - in this case greed - hurts even more. Knowing further that several who were indeed trusted were complicit in this crime - through their sheer oversight and lack of caution, hurts all the more. And finally after all these years, when the none of the perpetrators, in fact, not even one of the accused is prosecuted, one feels cheated and perhaps absolutely worthless. So it has been 25 years spent in the pursuit of justice and though the sufferers have suffered enough, they see no light at the end of the tunnel, much like the darkness that enveloped them 25 years ago!